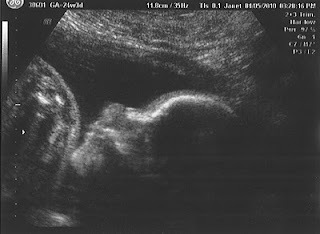 Sonogram: So our 24 Week Dr. Appointment went well. We had to reschedule the actual visit with the doctor for Tues. since he was out of the office sick. On Monday we got to see our beautiful little ladies again. The measured their noggins again and checked their heart rates. At this point baby A is about 1 lb 10 oz and has a heart beat around 143. 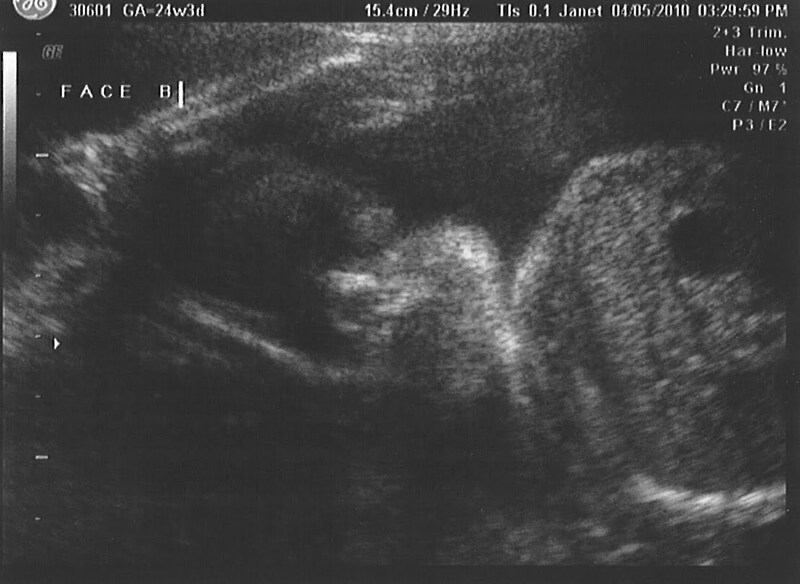 Baby B is about 1 lb 8 oz and has a heart beat around 153. They both have plenty of fluid around them, but are looking a teensy bit more cramped than they were last time we saw them. 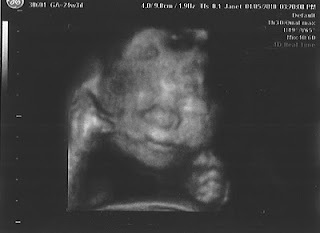 When we first got her up on the screen, baby A was moving her mouth like she was talking to us - so cute. 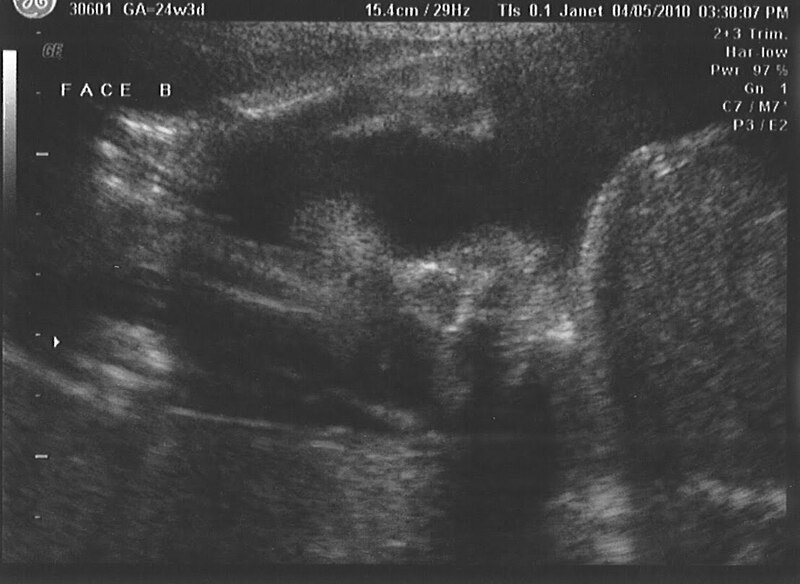 When we went to take a peek at Baby B she must have been practicing some yoga moves as she was apparently bent at the waist with her head between her knees. 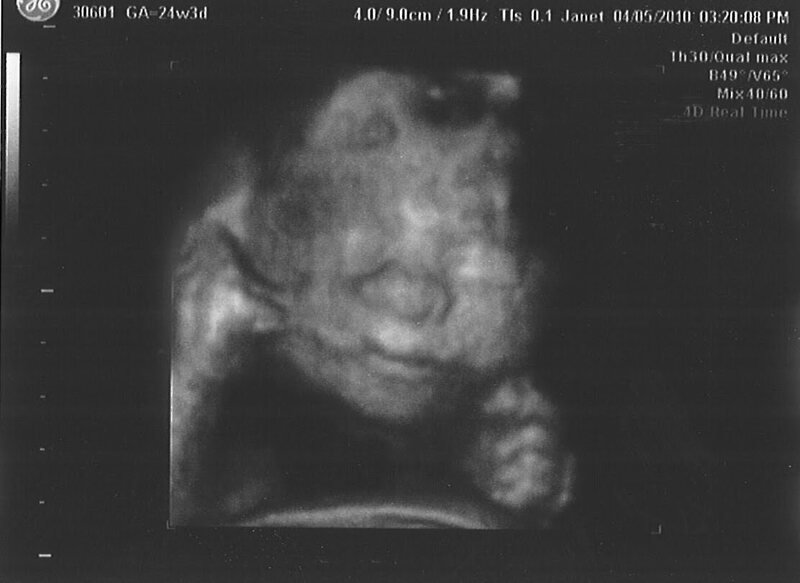 It doesn’t quite look comfortable to me, but the ultrasound tech said she sees it all the time. Such a silly girl that baby B. Overall, the doctor was nothing but pleased with my progress. He said the weight difference between the girls was less than 9% and really anything less than 15% is good. Both of the girls look to be developing very well and my body’s still doing well at providing them a safe place to grow. My next appointment – with bonus Glucose screening - So next visit I will get to down my sugary drink and they’ll test my blood for insulin resistance. The doctor gave me some tips on how I can increase my odds for passing the test, especially since with twins I have a 1 in 4 shot of failing it. If I fail it then I will have to do the four hour test with involves 2 sugary drinks and 1 blood draw each of the four hours after. Since that’s not really high on my list of fun things to do, I think I’ll take his advice and do my best to eat the most balanced meals possible the few days leading up to my test. The girls arrival - We talked a little about when we might want the girls to make their debut, provided if the girls don’t choose their own date. 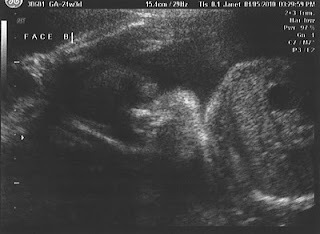 According to the studies that he’s read, it’s been proven that twins develop faster in utero than singleton babies do. So when it’s commonly believed that singleton’s lung development is done around 37 weeks, it’s 35 weeks for twins. I never would have thought that, but I guess my body is much further ahead in its preparation for the girls than I am ;-) That being said, the doctor said he wouldn’t want to schedule anything before 37 weeks just to be on the safe side. He really didn’t think it was necessary for me to go past 38 weeks though. So it looks like we’ll have the girls sometime between July 2nd and July 9th. That’s about 12 weeks away – can you believe it! In other news – last night, April 13th was my first Plano Mom’s of Multiples meeting. I was amazed at the turn out! They are very sweet to their expecting mothers, providing water, snacks, and very helpful welcome packets. There was a woman there that spoke to us about cloth diapering (which I am very interested in) and another woman that talked about chemical pollutants to be on the look out for. Unfortunately, I wasn’t able to stay for the potluck dinner or the main speaker (about safety in the house), but I did have a good time and am looking forward to seeing these ladies again. There’s a lot I can learn from them. I also got to meet my MOM (mother’s of multiples) mentor, Juliet. She’s so helpful and encouraging. She makes me believe I can actually do this whole twin thing! There’s no meeting for May, but I’m definitely going to try and make the June meeting. Our West Texas baby shower is this Saturday – April 17th. We’re super excited to see everyone! We’ll have our next appointment on April 21st, so I’ll make sure to update you all on that. We’ll be interviewing some more daycares soon too – such a crazy big decision!I’ve got to admit, I’m a little overwhelmed and nervous about it.